The ShellTile class gives you access to all the Live Tiles for your application. Before you ever create a single tile, you always have one tile. This tile is the default tile that your application will show if the user manually pins an application to the home screen. You can add additional Live Tiles manually. Each of these additional tiles are specifically to link deeply into your application. For example, if I had an airline application, I could have additional tiles that linked directly to individual flights. Let’s get started. You can create the StandardTileData instance to contain the new, updated information then call the ShellTile’s Update method to update the tile. This updates the tile immediately. The StandandTileData includes information about the new Live Tile. You also need a Uri that points to a deeper part of the application. 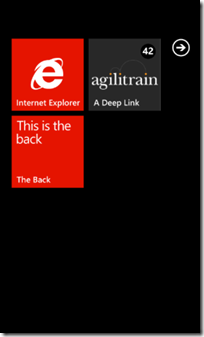 In this case the Uri points at a deeplink.xaml file that is in my project and I am including query string information. This Uri is important as each tile must point at a different Uri to your application. Finally you can use the ShellTile.Create method to then create the new tile. When the Create method is called, your application will be suspended and the user will be taken to the Live Tile on the home screen. This behavior is to prevent unwanted new Live Tiles. This makes it clear that the current app is the one adding the Live Tile and allows the user an opportunity to remove it. Hitting the back button returns them to your application (with Fast App Switching). BackTitle: The small text on the bottom of the tile. BackBackgroundImage: An image that takes the whole space of the back of the tile (must be 173×173 and be .png file).